Bruce A. Shaw founded the Davenport Trap Company in 1909, producing a trap called Sure Death. Four years later, he moved the mostly mail-order business from Iowa to Oak Park, Illinois, where he renamed it Trapper’s Supply Company. This invention relates to an animal and/or fish trap. The provision of a chain support on the fixed jaw allows the trap to be suspended in a perpendicular position when the trap is used for catching fish or water-living animals. The No. 1 trap’s one-piece cast metal bottom jaw/frame (or “bow”) had seven cast teeth. The top jaw had eight. The bigger No. 2 (advertised for skunk and raccoon) had 13 teeth cast in the bottom jaw but none in the flat-metal top jaw. The traps also could be set flat on dry ground. Most have two triggers that can be set independently. 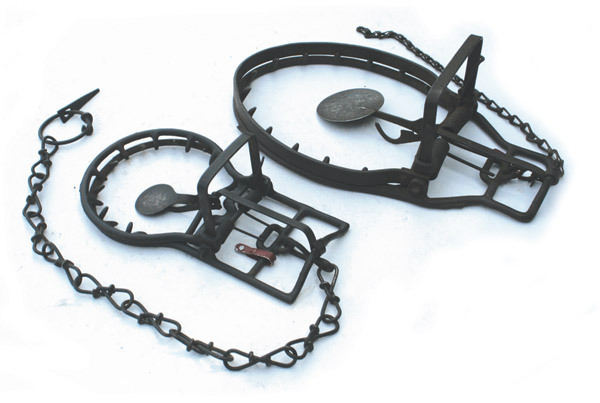 One is a bait trigger designed to catch the animal by the head as it pulls on the bait; the other is a foot treadle that fires the trap when an animal steps on a pan while attempting to pass through the trap jaws. When using the pan trigger, the trap is set with one jaw flat on the ground and the other straight up at 90 degrees, appearing like a bow for an animal to run through. The 1915 Trapper’s Supply catalog states that the side arms of the setting bail can be folded in and down for compactness when storing the trap or when packing it out on the trapline. Shaw’s company also sold the Sure Death Traps, Shaw’s Pneumatic Smoker (used to smoke skunks from their dens), Shaw’s Drowner (a triangular metal piece that slid on a long wire to serve as a drowner), Trail Scent/Animal Bait, flat wire fur stretchers and other trapping supplies. He closed the trap company in 1916 and began making automobile accessories, instead. Collector value for a No. 1 Alligator ranges from $150 to $250, depending on condition. The No. 2 ranges from $100 to $150, also depending on condition.